Continued from previous page, this page: Manville, Addison A. Spaugh. 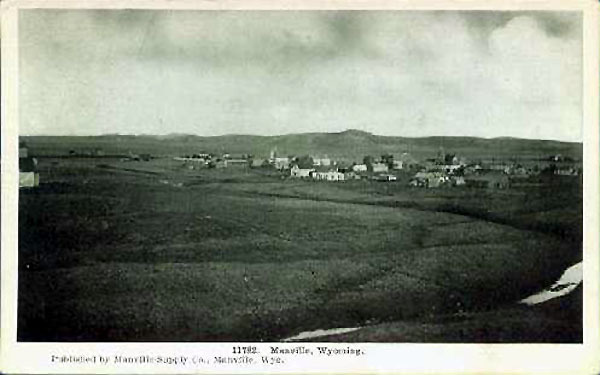 With the coming of the railroad, Manville to the west of Lusk, was a supply and shipping point for cattle for several large ranches to the north including the "77" and the "OW." The town was named by Addison A. Spaugh (1857-1943) after Hiram S. Manville, a co-owner with James S. Peck of the Converse Cattle Company (the "OW"). 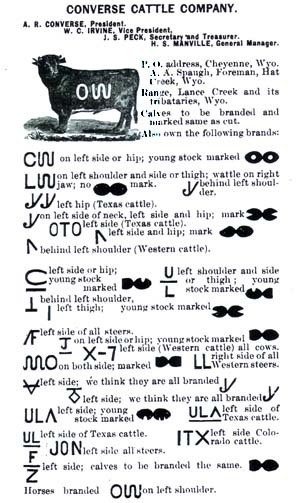 The Converse Cattle Company, in turn, was named after A. R. Converse, a Cheyenne banker. The early history of Manville is to a great extent the history of A. A. Spaugh. The "O W" near Lance Creek,1883. 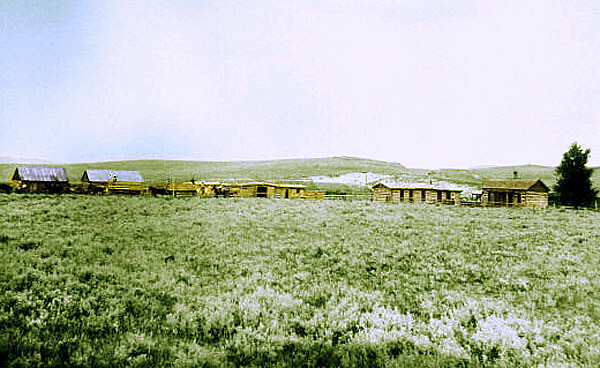 Spaugh first came to Wyoming up the Texas Trail in 1874 delivering cattle to the Red Cloud Agency. Addison was born in Indiana and his parents moved to Kansas. At age 14 he was orphaned and became a cowboy. He came up the Trail with an outfit captained by Mac Stewart (1844-1909). Another cowboy on the trek was James Cook. Cook later recalled that the outfit in Indian Territory ran into a terrible storm in which it rained for two days and two nights. After two nights keeping the cattle from stampeding, most of the cowboys gave up and left Mac with only three young cowboys, Addison Spaugh, Charley Dyer and Bert Helbert along with Cook. Cook later commented that Mac was "with the cattle all the time, and would have fallen dead from his saddle before he would ever have let them get away from him." To stay awake Cook had to rub tobacco juice in his eyes. Mac prided himself on his toughness and credited it to his three years in the Confederate Army. By 1895, Stewart had given up trailing cattle and had become superintendent of a mine near Parral in southern Chihuahua. On May 31, 1895, Mac got involved with a shootout with a local police officer when Stewart yelled out "Hurrah for Dixie." Mac was shot in his leg and the police officer ended up dead. Mac was found guilty and sentenced to death by firing squad. Cries of outrage from Confederate veterans and the Texas Legislature led to the sentence being commuted to life in solitary confinement. Appeals from the Texas Legislature and the Confederate Veterans continued and finally in 1905, the Governor of Chihuahua pardoned Mac. He died four years later at his brother's home in Whitney, Texas. 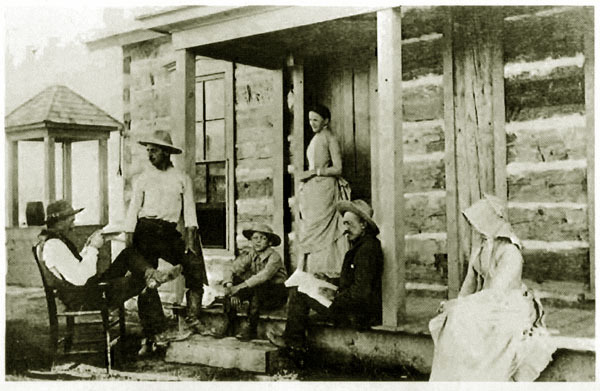 In 1874 Spaugh was employed on the old JHD ranch on Horse Creek. In 1879 Spaugh was emplyed on the OW, west of Hat Creek. Among those who sometime later joined Addison were two younger brothers, Curtis "Curt" E. Spaugh (1863-1909) and Willian Plum "Billy" Spaugh (1875-1965). Addison was foreman for the famous 1884 Roundup (See Cattle.) Curt at the time was employed by Horace Plunkett's E K outfit served as assistant foreman. After the roundup, Curt was fired by Plunkett. Billy was later employed on the OW At the time he was on the O W, Billy would hardly have been old enough to shave. In 1889 the OW moved lock, livestock and barrel to Montana. Addison before the move served for a while as its general foreman. Manville was the site of Spaugh's homestead. 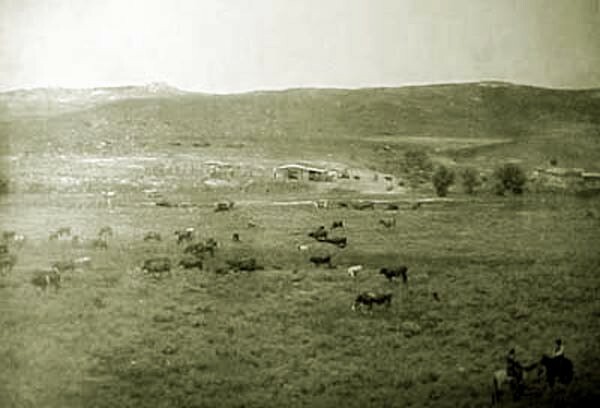 In 1898, Spaugh acquired the "77" and the Horseshoe ranches together with 2,500 head of cattle from Thomas B. Hord (1850-1910) and Amsy Hord who owned the Lance Creek Cattle Company. 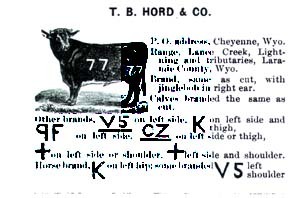 The "77" brand dates to 1875 when Moss Wyatt branded his herd of cattle with 77 brand. The brand was subsequently sold to T. B. Hord who built up the ranch located north of Manville. Hord Family on porch of the "77," undated. 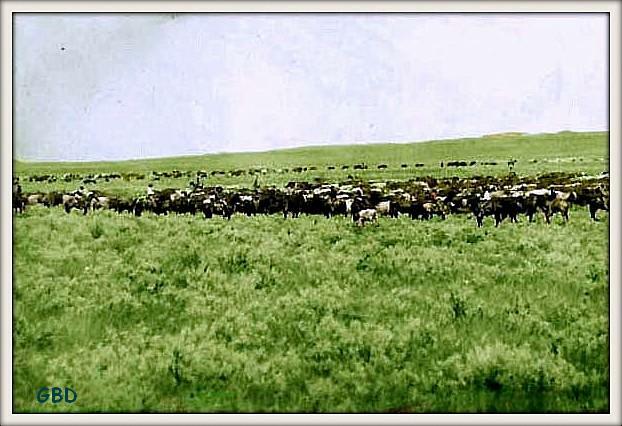 About 1887, Hord moved his main operation to Central City, Nebraska where he maintained a feedlot operation. 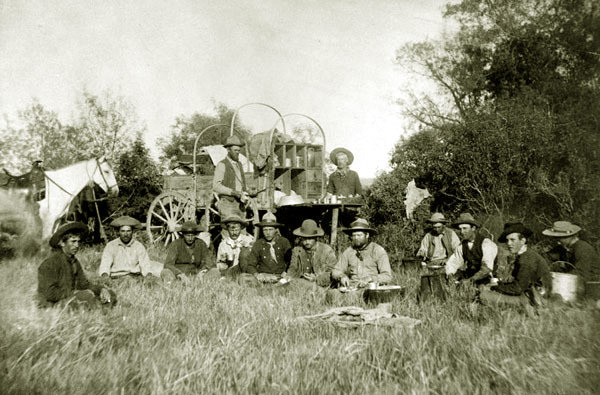 About 1898, Hord sold the ranch in what is now Niobrara County to Spaugh. Roundup Crew on the "77," undated. Within four years Spough's operation had increased to 20,000 head of cattle and had fenced some 1,500,000 acres of public lands. The fencing of federal open range had been illegal since Feb 25, 1895. Nevertheless, the law was generally ignored, sometimes with the conivance of officials in the western states. In Texas, as an example, the Texas legislature made the fencing of public lands a misdemeanor, but the cutting of the illegal fence was a felony punishable by one to five years in the State Penetentiary. Scene, based on a photo, is of a Roundup in the 1880's approximately 20 miles north of present day Manville. Background music this page "Hang the Key on the Bunkhouse Door" as sung by Montana Slim. Next Page: Manville and Addison Spaugh continued.